compromised vital and devital teeth for many years. Structurally compromised teeth have been traditionally restored using either amalgam restorations or full crowns; this approach is not a biomimetic approach. Biomimetic indirect porcelain-bonded restorations and indirect/semidirect resin-bonded composite restorations have been progressively replacing traditional restorations. However, stress-reducing direct composite (SRDC) restorations have been proposed as a valid alternative to indirect resin-bonded composite restorations (Deliperi & Bardwell, 2002, 2006; Deliperi, 2008; Deliperi & Alleman, 2009; Deliperi, Bardwell, Alleman, 2012; Deliperi 2012). After a dozen of years of clinical success with SRDC, Dr Deliperi would like to introduce a new concept in biomimetic dentistry for the first time in this web-page. It is “The cycle of tooth preservation for structurally compromised teeth” which is diametrically different from “The tooth Cycle of death”. In other words, the Stress-reducing direct composite (SRDC) biomimetic protocol prevents the “The tooth Cycle of death”. What is “The tooth Cycle of death”? “The tooth Cycle of death” ultimately results in failure and loss of a tooth and replacement with an implant. Structurally compromised teeth are teeth that underwent substantial loss of tooth structure due to previous caries, pre-existing restorations and endodontic procedures. Cast coverage restorations and large amalgam restorations have been selected for the restoration of endodontically-treated teeth for many years. Metal-based restorations and the residual tooth structure behave as two different entities during function because they are not bonded to the residual tooth structure. They also have a coefficient of thermal expansion different from those of both enamel and dentin. As matter of fact, the residual tooth structure is continuously subjected to both occlusal and thermal stresses. Furthermore, the need for mechanical retention or resistance forms like boxes, grooves, slots, pins and posts creates regions of great stress concentrations which dramatically weakens the residual tooth structure and increase the potential for crack formation. What is the Deliperi protocol? It is a biomimetic restorative protocol that was first published by Dr Deliperi in 2002 in the Journal of American Dental Association (JADA). The application of this protocol allows to maximize the bond and minimize the stress in a restoration to mimic the functional and optical characteristics of the intact natural tooth. Both the maturation of the bond , the strategic layering and curing protocols are the milestone for stress reduction on the residual cavity wall. 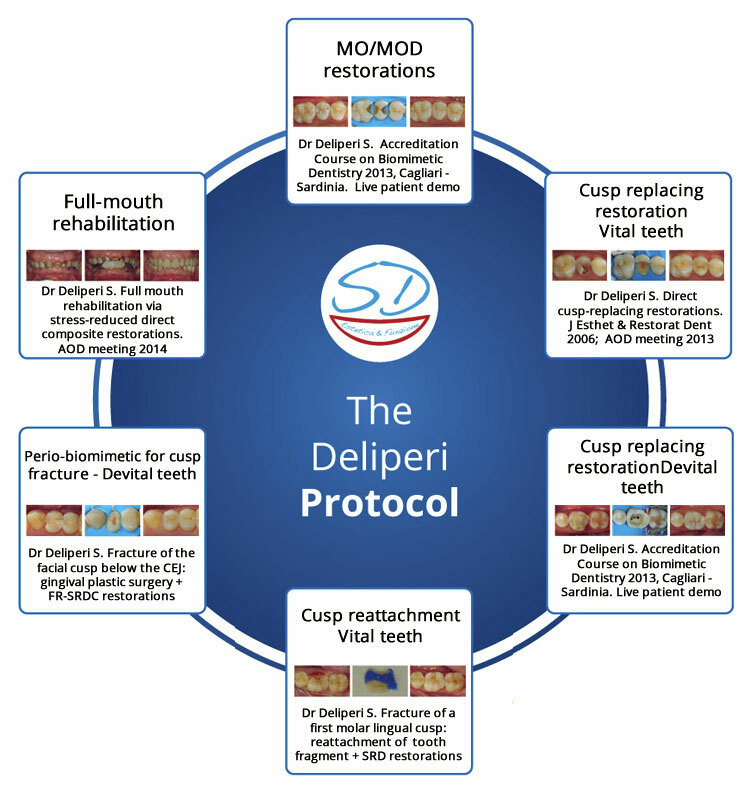 Dr Deliperi has further developed this protocol in the last 12 years. When most of the tooth structure on both the lateral and proximal walls of severely structurally compromised teeth is lost, the “wall-papering” of the residual cavity walls with polyethylene fibers helps to both emulate the crack shielding mechanism of the dento-enamel complex (DEC) and absorb the stress from either polymerization shrinkage or occlusal load. The Deliperi protocol stops “The tooth Cycle of death” and starts “The cycle of tooth preservation ” for structurally compromised teeth. No endodontic treatment, no crowns, no posts are required. By using Dr Deliperi’s stress-reducing direct composite (SRDC) biomimetic protocol, clinicians can predictably preserve the remaining sound tooth structure in both medium size restorations, cusp-replacing restorations and in the full-mouth rehabilitations. With a solid scientific background in mind and a continuous training, clinicians may perform restorations able to recover the original strength of the natural teeth on both the vital and devital teeth.